I work at the FANS shoes factory in Tangerang, Indonesia. Our company has produced FANS shoes since 2001. As an Operation Director, I have to maintain smooth operation in the whole process, to improve our product quality and services. Currently, we have remote offices in Medan, Palembang, Surabaya and Solo that connect directly to our factory in Tangerang. All of our offices use free and open source software for daily operations. When did you decide to migrate to open source software – and why? We started to introduce FOSS to our staff in 2007 by dual-booting MEPIS Linux and Microsoft Windows XP on one out of three PCs that we had. It was a complete failure; the users almost never booted into MEPIS. Learning from the past mistakes, in 2012 we did a partial migration with five new notebook PCs installed with Linux Mint 13, for all managers and some higher-level staff members. Seven old PCs were still running Windows XP. In 2013, we migrated almost all of the PCs to FOSS – only one Windows PC was left in the research and development department, because it was still using Corel Draw. In March 2014, we had a special training for using Inkscape, a vector graphics program. After the training, we fully migrated to FOSS. As of today, we still use only FOSS in all of our operations. The main reason we migrated to FOSS was to have reliable and stable operations. Around 2012-2013, there was a nasty computer virus in Indonesia called Brontok. The main anti-virus programs were not fast enough to handle the widespread attack, so the only way to fix it was to reinstall the operating system. This was so bad because of the high downtime in the reinstallation process. The only PCs that were not affected were Linux-based PCs. Since we migrated to FOSS, we have never reinstalled the operating system because of viruses or malware, even though we never use anti-virus software on our Linux-based PCs. The other reason we use FOSS is cost-saving. Proprietary licenses are very costly; for each application we have to purchase separate licenses for each machine, while with FOSS the programs are completely free and we can install them on as many machines as we want. Our company has saved 133 millions Rupiah by using FOSS (around USD 10,000). My first experience with open source software as when I was a university student. I graduated from CalPoly (California Polytechnic State University) in San Luis Obispo. My major is MIS (Management of Information Systems). One of our computer classes introduced us to Red Hat Linux. Honestly, I didn’t have a good experience with it (I believe it was Red Hat 4.0). It took a long time and it was very complicated just to install the OS on an early Pentium machine (just to get the display to work correctly, and the configuration was really difficult for a regular user too). Well, it had a GUI, and some applications like AbiWord and Gnumeric but it was painfully slow. So at that time I believed that open source software was not for a regular users. After I graduated, I worked in the logistics department of PT. Rodamas Jakarta (a nation-wide distribution company). One day, I saw InfoLinux magazine (a local Indonesian magazine that focuses on open source software) in the IT department. The magazine had a lot of good articles, and it came with a CD/DVD that contained a variety of Linux distributions. I also subscribed to this magazine. I become more interested in the open source world, and tried several live distributions like Knoppix without installing the OS. Some came with OpenOffice which was similar to Microsoft Office. I liked OpenOffice better than Gnumeric and Abiword. My wife used to work in Haga Bank (a local Indonesian bank now acquired by Rabobank). Her office was using Fedora Linux and OpenOffice for daily operations without any critical problems. Learning from her experiences, when I became Operation Director at FANS shoes, I started the FOSS migration. Why did you choose LibreOffice? Because most Linux distros thesedays come with LibreOffice. It’s better to use the office suite that comes with the distro; it saves us time, as we don’t have to install another suite. For our company, LibreOffice is the best replacement for Microsoft Office. If there were no LibreOffice, we would probably have never migrated to FOSS. I have an interesting story about LibreOffice: one time, my brother called me to ask for some help with his computer. He said he had received a Microsoft Office document file (docx), but he couldn’t open it. Unfortunately, his computer had an outdated OS and MS Office (Windows XP and Office XP). He said that it’s urgent, that he needed to read the content of this document now. Well, it was late at night, so he was not able to get the installer from the computer store. So I said to him, try downloading LibreOffice, and see if it can open the file. So, he installed LibreOffice in his PC. He was really fortunate that the docx file could be opened with just a little problem (the text was not aligned properly), but at least it was readable. Since then, his computer has LibreOffice, and he continues to use it. How popular is FOSS in Indonesia? Open source in Indonesia is getting more popular. In the server market, open source solutions are growing rapidly here because they are cheaper than proprietary software. Unfortunately, it is not the same for daily home or office use of FOSS. Proprietary software like Windows, Office, Adobe suite, Corel Draw etc. are so dominant here. People are already familiar with these proprietary programs and are hesitate to change. Piracy is the main cause of the slow growth of FOSS in Indonesia – currently, there are more people using pirated software than original legal software. It is very easy to get pirated software in Indonesia. It can be acquired at many computer stores – and sometimes it is included for free when purchasing a PC. So in fact, it’s much easier to get pirated software than FOSS. Still, our government is a little bit strict with pirated software in medium and large companies. Because of that, some companies have adopted FOSS. So I believe Free Software will keep continue to grow in Indonesia, but the adoption rate of FOSS will depend on the how good its marketing is, and also how strict the law enforcement of pirated software is as well. What were your personal experiences in the Indonesian open source community? At the early stage of the FOSS migration, I pretty much did everything by myself. I learned FOSS mostly from the web. Fortunately, most FOSS literature is available in the English language, which I can understand. In our company, the LibreOffice migration was a lot easier compared with migrations to other programs like Inkscape and GIMP. At first, we were having trouble migrating to Inkscape until we met Sokhibi (owner of Istana Media, and writer of several open source books). We invited him to train us using Inkscape. From there, he introduced us to Blankon Linux (a custom Indonesian Linux distro). He was the Documentation Coordinator of Blankon Linux. Then the Blankon community helped us a lot in our migration – we even have a custom version of Blankon Linux specifically for our company needs. 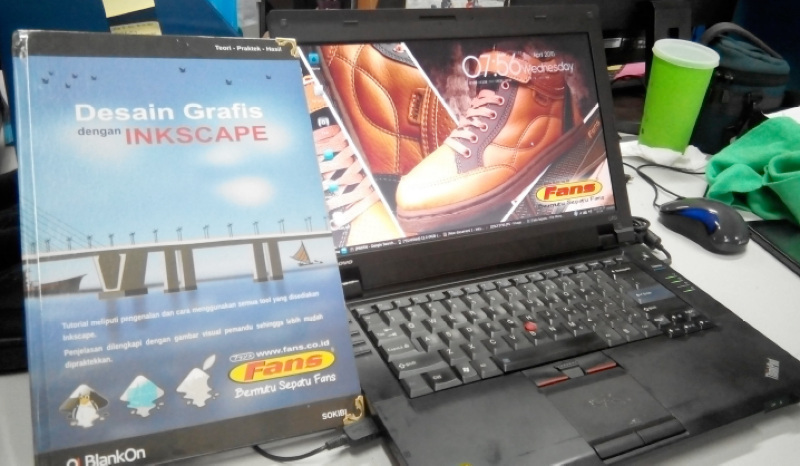 Together with Ahmad Haris (Blankon Public Relation Coordinator), we created a writing contest for using FOSS, and we released an Indonesian Inkscape guidebook. 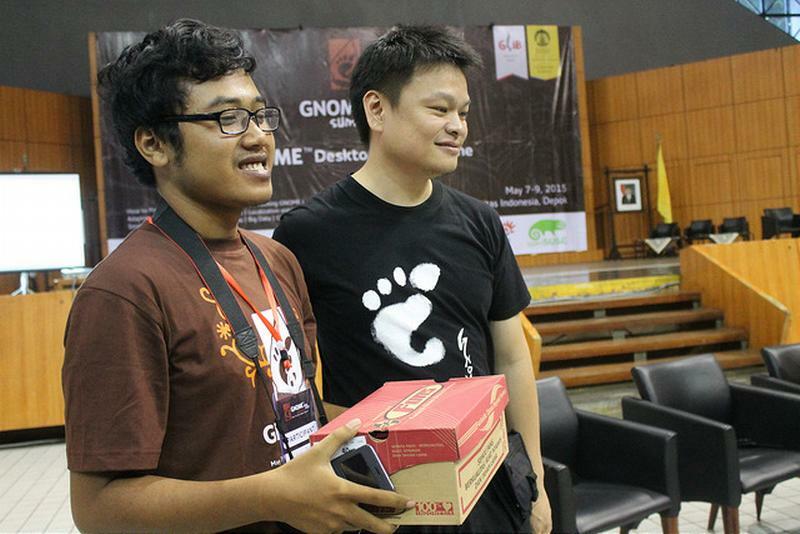 In 2015, we had the GNOME Asia Conference in Indonesia – this was my first time being a guest speaker at a FOSS conference. I met so many excellent people from around the world that were helping the FOSS movement! I was introduced to other local open source communities (such as openSUSE Indonesia, Ubuntu Indonesia, the Indonesian Linux User Group etc). Since then, I have been active with our local FOSS community, and our company has sponsored several FOSS activities/projects. 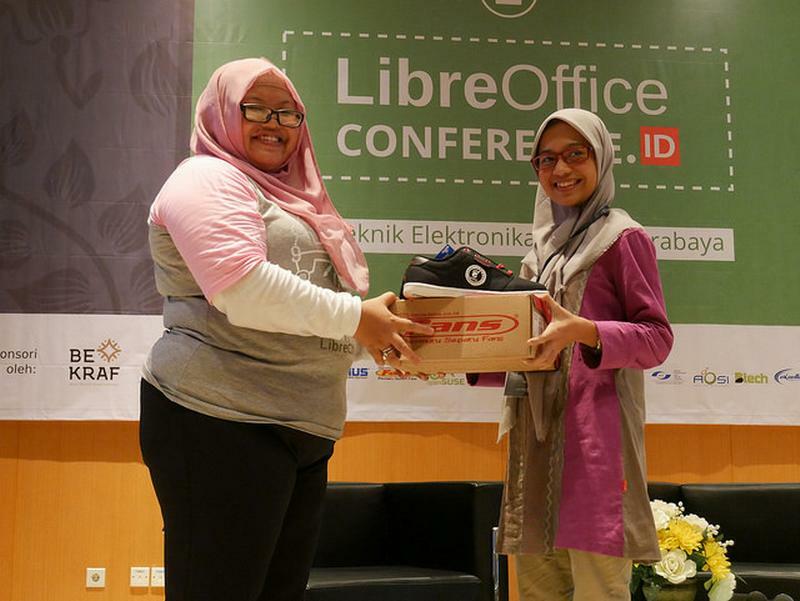 In 2018, we held an Indonesian conference for LibreOffice. It was a big success, so many people are eager to know about the software. 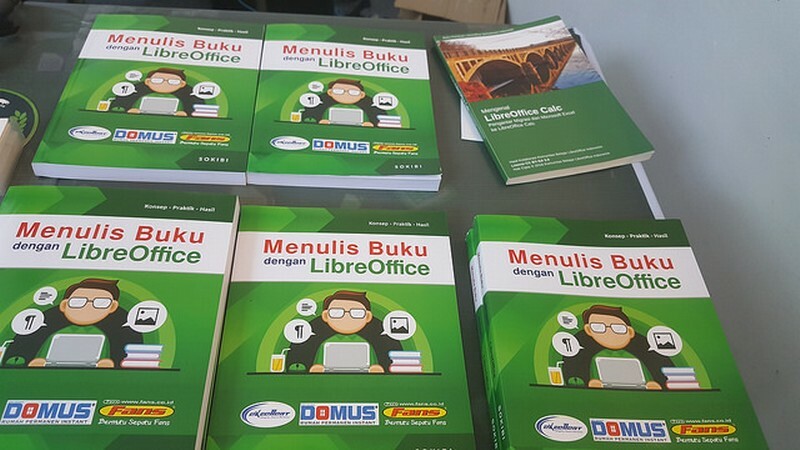 Sokhibi also released an Indonesian LibreOffice Writer guide, which is sponsored by our company. The LibreOffice project was born in Europe, and had strong roots in that continent. What should we do to increase the market penetration in Indonesia? LibreOffice videos. We need a lot of videos about LibreOffice tutorials in Indonesian language. LibreOffice Promotion videos. All LibreOffice videos should be available on popular streaming media. Support for other platforms. Fully working LibreOffice for other platforms (ARM, RISC V, MIPS) should be available. The current LibreOffice viewer in Android is not enough. LibreOffice should also be available on emerging market of single-board computer platforms like Rasberry Pi, etc. Thinking of the culture barrier and language barrier: which is the bigger one for open source? With better technology, the language barrier will become smaller and smaller. We can now use many translation applications to help people adopt FOSS in many different languages. However, a culture barrier like the “piracy culture” I mentioned is not an easy thing to be solved. Probably it needs several generations of efforts to significantly reduce it. To end piracy, people need to change their mindset which I think is very difficult. We need to fight this piracy culture because it is bad for the whole community. For Indonesia, I believe this is number one enemy to the FOSS movement. Finally, where do you see LibreOffice in five years from now? I see great prospects for LibreOffice. In five years, I am sure LibreOffice will be gaining more and more users. The format war will be a long war, but in the end, the Open Document Format (ODF) will win the war. Like the web browser wars where the proprietary browsers are losing, I believe LibreOffice will one day win over MS Office. From version to version, LibreOffice is getting better and better while still retaining format compatibility, which is the key benefit of using LibreOffice. I believe LibreOffice will have a high chance to become the most-used in Indonesia with great efforts. When LibreOffice becomes the number one office suite here, I think all of the remaining South East Asia countries will follow. Thanks to Iwan for his thoughts and feedback! One of the goals of LibreOffice is to be available in as many languages as possible, so if you’re reading this and want to help translate the interface into your native language see here to get started! Will someone PLEASE contact me ? IT is urgent. I have an important question and couldn’t get past that awful recaptcha. I cannot use the community or get any support if I can’t pass that thing and it is VERY difficult for me with my vision now. I am also no longer on twitter due to my vision so I can’t follow you there, twitter is just too much for me now. PLEASE, PLEASE, someone contact me via e-mail and see if can’t do something. We have give an e-mail here and I’ve used my askLibO community name so someone ought to be able to contact me. PLEASE HELP. Misticat, we simply can’t give one-to-one technical support (we’re a small non-profit entity, and there are millions of LibreOffice users around the world). If you’re having trouble with the reCAPTCHA on the Ask LibreOffice site, an alternative is the user mailing list: send a mail to users+subscribe@global.libreoffice.org and then follow the instructions in the reply. Then you can put your questions to other users!